Hippie clothes. Bohemian clothing. Artsy clothing for expressive people! Presenting classic gypsy hippie bohemian shabby chic styles for creative people. Handmade boutique styles at affordable prices. 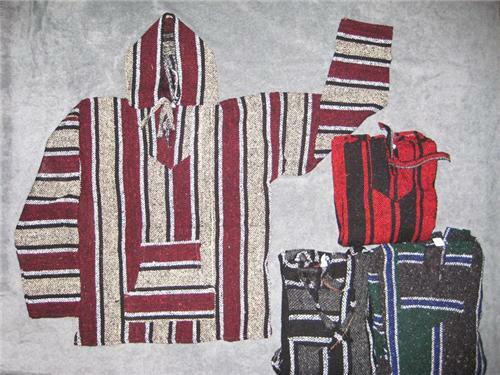 This is a traditional handmade Mexican BAJA jacket hoodie poncho pullover. It can be worn by both men and women. It is made of an Acrylic blend of materials. Pullover styling, one large front pocket to warm both your hands, two ties at neckline, 3-4 inch side slits at hemline, and a hood. Comes in sizes S M L XL XXL in many assorted color combinations. All of the jackets are multicored. Color choices represent what we think is the main color. Most jackets consist of a main color plus black however some jackets have more than one color plus black. Check the measurements below.